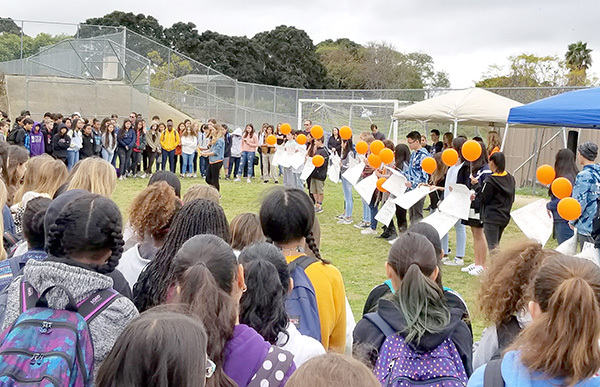 order now On March 14, students at Lewis Middle School in Allied Gardens joined hundreds of thousands of other students from across the country in a walkout to protest gun violence in schools following the death of 17 students at Marjory Stoneman Douglass High School in Parkland, Florida one month earlier. click here The Lewis students rallied on the school field, carrying cardboard signs. Some carried 17 orange balloons to symbolize the victims, and some read poetry. Callianna Priebe, 8th grade, read a poem written by one of the Marjory Stoneman Douglas victims and Iris Drake, 8th grade, read aloud an original poem. click here “When I was little, I was terrified by the raw power of a shotgun. I had just seen my grandfather pull the trigger, and I was immediately enamored and fearful with its sheer strength,” Drake read. https://conversionfanatics.com/healthandwellness cheap generic viagra mail order pharmacy “Nine long winters have passed since that thanksgiving in Montana, but I remember the gun all the same. It has an elegance of sorts to it, a brutal, awful elegance. And It was just last year I shot a gun for the first time, and the incredible power you feel, to rest your finger around the cold metal trigger, it is a feeling not unlike falling, fear and exhilaration wrapped up in fun and excitement. Perhaps this is the cruel truth of the gun, that the weak and broken will always reach for an assault rifle simply to give them that moment of fear and power and enlightenment.